At KOR, innovation and dependability go hand in hand. We strive to produce the world's best lighting products – lighting that's good enough to carry on a dazzling legacy of innovation and excellence. Using high-quality materials, cutting-edge technology and chic designs, you can count on KOR to brighten your home, as well as your day. The multi-chip package results in a greatly increased lumen output per square inch. As such, the KOR Fixture emits a bright 1050-lumens, natural light to furnish comfortable and adequate lighting in any interior setting. This edge-to-edge lighting design delivers bright, consistent illumination throughout every corner of your living space. Say goodbye to dim lighting and hello to the ray of sunshine this light fixture is about to deliver throughout your home, every day for years to come. Whether you use it in the foyer, hallway or kitchen, the ceiling light is an essential fixture in any home. The KOR 12-Inch LED Ceiling Light Fixture is outfitted with built-in LED lighting to save you the time and expense of replacing LED bulbs. The elegant shade eliminates glare, attractively curved to provide the perfect ambiance in any interior space. It’s sure to become the most attractive focal point in your home! Simple yet sleek, this light fixture provides an elegant, modern touch to enhance any existing decor. 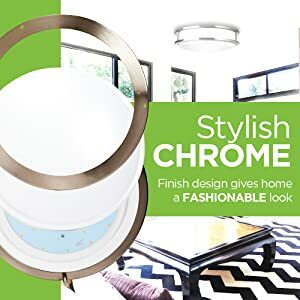 The flush-mounted light features a minimalist design, boasting a chic curvature and furnished with a stylish chrome base to give your living space a classy look. Even with the light off in the daytime, this brilliant finish will brighten your living space as it beautifully reflects your interior design. Step into the future with the a light fixture boasting integrated COB Diode Technology. Multiple LED chips are bonded directly to the interior of the fixture, taking up less space while delivering more light. This low, 15-wattage light uses less energy yet endures for longer periods of time, making it the perfect replacement to any incandescent or fluorescent light. Stop replacing light bulbs and opt for a cutting-edge, innovative light fixture instead. Not only will you save time by not having to replace light bulbs, but this light fixture is also easy to install. 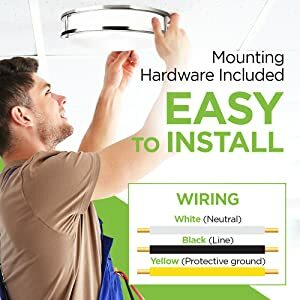 It comes with included hardware and easy-to-follow instructions, allowing you to mount it to any ceiling in your home in no time at all. 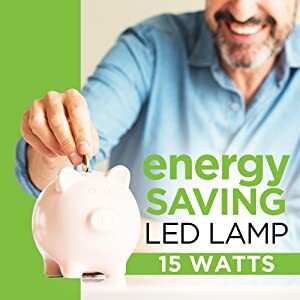 Place it in the foyer to provide some much-needed light when entering the house at night, in the hallway to ensure you can see while making your way to the other end of the house, in the kitchen to provide adequate lighting while whipping up your meals, or in the living room where the family congregates on a daily basis. ✔️ BUILT-IN LED LIGHTING. Designed to provide you with a cutting-edge fixture, the KOR 12-Inch LED Ceiling Light is equipped with built-in LED lighting to eliminate the need for buying and replacing expensive bulbs. ✔️ ENERGY-SAVING LIGHT. Enjoy lighting up any room in your house and save money on electric bills at the same time. This low, 15-wattage light uses less energy and endures longer, making it the perfect replacement to any incandescent light. ✔️ HIGH-PERFORMANCE. Emitting a Bright White / Daylight 5000K color temperature boasting 1050 lumens brightness, this fixture will effortlessly provide your house with clear, adequate lighting wherever it’s placed. ✔️ VERSATILE USE. Ideal for the kitchen, hallway, foyer, living room and other locations, this KOR 12-Inch LED Ceiling Light Fixture is furnished with a stylish chrome finish to seamlessly blend in and enhance any interior design. ✔️ EASY TO INSTALL. You don’t need to be an electrician to install this innovative light fixture. Simply use the included mounting hardware and easy-to-follow instructions to install the light in no time at all.